"Please God, let me write like a man." With decades of hindsight, the Algonquin Round Table seems like a group more famous for its reputation than its accomplishments—the received wisdom about them is that they were great wits, full of bon mots and cocktails, merrily whiling away the hours with gloriously clever badinage. This film wants to re-create those heady days, though because it seems to try too hard, it seems like a lot of false nostalgia, an old timer telling us that things were so much better then, the people were funnier, the drinks more potent, the women more beautiful and the men more dashing. Wasn't that a time? Alan Rudolph's film tells the story of Dorothy Parker, in some respects the mouthy gun moll to the men of the round table, and from the jump the picture is awash in nostalgia—it begins in Hollywood, in 1937, with Mrs. Parker and some of her Algonquin comrades slumming it in the movie business because of the size of the paychecks. These sequences are shot in black and white, but then we bleed back into the past and move across the country and into color, when, other than the coming of Prohibition, all was right with the world, and the world was New York. Jennifer Jason Leigh plays the title character, and she's one of those actors that so wants to lose themselves in a role that the performance becomes something of a stunt—her exaggerated diction in imitation of the historical Mrs. Parker is so extreme that it becomes a performance about an accent, on some level. (Sean Penn is frequently guilty of this same sort of Method madness.) Rudolph links up his episodic film with bits of an older Mrs. Parker delivering some of her doggerel directly to the camera—we're supposed to be amazed by Leigh's transformation, but you can't help but think that she's trying a little too hard, that if she'd just settle into the role and inhabit it a little bit more, it would be a more compelling performance. Certainly lots of Mrs. Parker's trademark wit is on display—some of it is from the actual figure, and some of it is the clever invention of Rudolph and his screenwriting partner, Randy Sue Coburn. On some level this is a chaste love story, about the unconsummated romance between Parker and Algonquin staple Robert Benchley, deftly played by Campbell Scott, sporting an extreme accent of his own—his Benchley does not believe in the pronunciation of midword "r"s, so with grand formality he's forever referring to his leading lady as "Mrs. Pahkah." Scott is more dashing than the actual Benchley—even he has been giving the Hollywood treatment, though Scott's rendition of Benchley's trademark Treasurer's Report is most endearing. 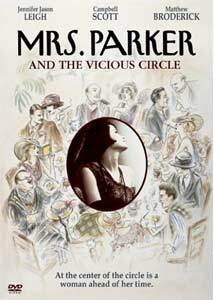 But even if Parker and Benchley never get over their obstacles, Dorothy doesn't go wanting for male attention or companionship—Andrew McCarthy is her hophead wastrel of a husband, and Matthew Broderick has a fine turn as Charles Macarthur (most famous perhaps as co-author of His Girl Friday), who charms and then tosses off Mrs. Parker as just one in a series of conquests. The movie is crammed with cameos, and it sometimes feels like Rudolph is spending too much time trying to get them all into his movie—David Carradine shows up briefly as Will Rogers, for instance, and Lili Taylor as Edna Ferber, and swatches of the movie are given over to Harold Ross and the birth of The New Yorker. It's tough to engage in a conversation with someone when they've perpetually got one eye on the door looking for a better offer, and that's the way you feel for much of this movie—at any moment, someone is likely to pipe up with something like, "Look, it's Helen Hayes!" Rudolph's affection for this world is clear, but you often wish that the movie came in an annotated version, so that you could track all the many characters who come and go. (Many of the little details are lovely, though, like the pan past the Algonquin menu—"Sauerkraut Juice: 25�.") And as far as art goes, it seems that a good time was had by all at the Algonquin, but that the truly memorable work of the period came not from this sort of backslapping, but from lonely souls (Fitzgerald, O'Neill) hard at work and alone, fellows that are nobody's idea of the life of the party. Image Transfer Review: Many of the scenes are shot in relative darkness, perhaps a function of the limited budget on which the film was made. Whatever the reason, the aesthetic style makes it very forgiving when it comes to the DVD transfer, which is acceptable if not always with the kind of clarity you might like; the reds and blacks especially tend to bleed out around the frame. Audio Transfer Review: Because so much of the movie consists of dense group scenes, a lot of the dialogue is looped, and you can practically hear the whirs of the ADR apparatus. Extras Review: The director's commentary track is rambling and intermittently silent, though Rudolph is helpful in providing some background info on some of the historical figures being portrayed, along with giving us the usual this-is-what-happened-when-we-shot-this stuff. He's also out to settle some scores with critics of the movie, which frankly makes him sound a little petty; he's a bit too enamored with Leigh's recitations of Parker's verse, too, for he says that "The poems are the soul of the film," and he tells us that what Leigh is doing here is "beyond acting," though I don't really know what he's talking about, and I'm not sure that he knows either. Would You Kindly Direct Me To Hell? The Infamous Dorothy Parker (47m:53s) is a biographical piece hosted by Wendy Liebman that borrows heavily from the feature, and also includes interview footage not only with members of the cast, but with Parker fans like Gloria Steinem, Fran Lebowitz and Brendan Gill. Unfortunately it seems that very little filmed footage of the historical Parker exists; we hear her, though, and her accent is not nearly as extreme as that of Leigh's in the role. Along with a trailer and a TV spot, there's also an interview (12m:13s) with Mark Isham, the film's composer, a discussion of his work with Rudolph on a number of different projects. An affectionate look at a lionized time and a legendary literary figure, but a movie that gets caught up in its own trappings a little too much.